Casper is an online out-of-the-box mattress company that has been doing business since 2014. They’ve got through a few design changes over the years, but one thing has stand consistent: huge popularity among fans of foam mattresses. We’ll be looking at the latest iteration of the Casper mattress, so read on and see what the hype’s all about. Should I Buy the Casper Mattress? The Casper uses four layers of foam to construct their mattress. It is designed to be well-suited to many different types of sleepers. The unique combination of foams offers a one of a kind sleep experience that Casper has consistently improved over the years. Top – The first layer is constructed from 1.5” of highly responsive poly foam. The foam and thickness in this layer are designed to provide a cool sleeping surface and to maintain the bounce qualities of the mattress. Second – The next layer is made from 1.5” of memory foam. The second layer offers relief from pressure points while providing support. Putting the memory foam as the second layer helps prevent any excessive heat retention that is sometimes associated with that material, while at the same time offering the hug and contouring qualities that memory foam is known for. Third – The third layer of the Casper mattress is made from 1.5” of poly foam. The third layer is designed as a transitional layer that will provide support while gently easing the body’s pressure onto the bottom layer. As you can see, the overall depth of this mattress is 9.5” of different types and layers of foams. 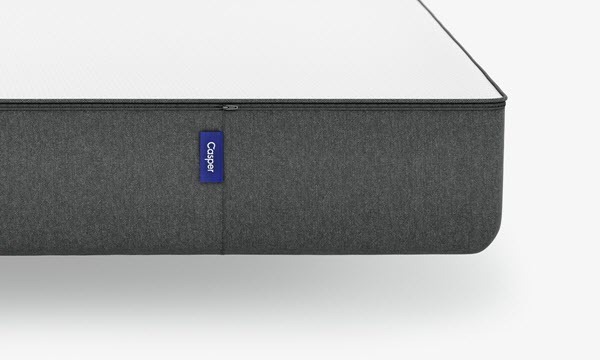 This unique and innovative design allows the Casper to get many of the benefits of the different materials they use, while also minimizing any potential downsides associated with using those foams in mattresses. Specifically, the use of poly foam on top of the memory foam allows sleepers to enjoy the hug and contour of memory foam without having to worry about the draw backs of greater heat retention, which can cause hot sleepers to feel uncomfortable while they rest. Moreover, the poly foam top is more responsive than memory foam by itself, which gives the mattress a better body contouring characteristic than you would expect from memory foam by itself. The cover on the Casper is a straightforward white design that consists of a single piece of fabric running from edge to edge. The cover is thin, stretchy, and soft. It is a great example of the style of cover frequently used by online mattress retailers these days, and offers a great combination of style, breathability, and comfort. The cover is clearly very utilitarian, but it does its job well. The thin nature of the cover means that not only will breathability and cooling be enhanced, but also means that sleepers will have a more direct encounter with the mattress itself, allowing them to enjoy the different aspects that make the Casper so unique. The top and bottom of the cover are 100% polyester, and the side panels are made from a 51/49 blend of polyester and polypropylene, giving them a stiffer feel to help the mattress keep its shape and provide additional edge support, which is nice to have in a foam mattress. When it comes to the firmness of the Casper, it is designed to be appealing to as many sleepers as possible. As a result, it’s a good choice so long as your preferences don’t rest on either extreme of the firmness spectrum. On a scale from 1-10, with 1 being the least firm and 10 being the most firm, the Casper ranks at a solid 6. While this is slightly on the firmer side of things, the Casper can feel unsupportive for heavier sleepers. This is largely due to the fact that the top two comfort layers are only 3” deep. As a result, sleepers over 250lbs might want to consider a different mattress option. Additionally, if you’re a bit under 250lbs, but you are a side sleeper, you may find that the sinkage means that you hit the support layers harder than you would like and risks creating pressure points. Thankfully, the Casper offers a reasonable trial period to let you get a feel as to whether or not the mattress is good for you. When it comes to hug and contour, the Casper falls within the range that you’d expect from a memory foam mattress. The poly foam top layer reduces the intensity of the contour that you’d experience from a 100% memory foam mattress, and creates a general compression area around where your body pressure rests. It should also be noted that the Casper does have a chemical smell the first few nights you sleep on it. This is to be expected with any foam mattress purchased over the internet and shipped to you, and it will diminish over the course of a couple days. The Casper mattress has gone through some changes over the years, with the earliest versions using a latex top layer instead of the poly foam in the current design. They also had a greater depth of support foam, but only one layer in the first version. In the next version of the mattress they reduced the depth of foam in the base and added 1.5” of poly foam. These changes show that the company is constantly trying to improve their product, which we take as a good sign for customer support and responsiveness. After all, almost no product is perfect, and efforts to improve are always appreciated. Our sinkage tests were conducted using an individual weighing ~140 lbs. The different tests are designed to see how much sinkage results from different positions that you might find yourself taking on the mattress, as well as the overall support of the material in general. Laying on back – This position resulted in 2.5” of sinkage in our tests. When laying on your back you’ll experience a more general hug that doesn’t closely contour to the body. Laying on side – When laying on the side we measured 3.5” of sinkage for the Casper mattress. Slight edge sit – Sitting on the edge in a way that didn’t rest the full weight of the body on the mattress resulted in 4” of sinkage. Full Edge Sit – When sitting fully on the edge and placing all of the body’s weight on the mattress we saw 5” of sinkage, which is among the highest we’ve seen in the foam mattresses we’ve looked at. Standing in Middle – Standing in the middle of the mattress created 6” of sinkage, which is also higher than many of the other mattresses we’ve reviewed. Casper offers financing options if you want to split your payments up. Their prices are competitive with similar mattresses at their price point. We’d recommend checking out some of their competitors so you can get a better idea about what these kinds of mattresses typically cost, as well as a better idea as to what kind of qualities and characteristics you can expect from a foam mattress from an online retailer. Shipping – Casper offers free shipping and will deliver in 2-7 days, although Amazon Prime customers can get guaranteed two day shipping. Warranty — 10 years, standard for the mattress industry. The Casper is a good mattress, and the company is constantly trying to improve on their product, but it’s not the best foam mattress we’ve reviewed. The top two comfort layers are only 3” thick total, and that doesn’t provide the support that many sleepers are looking for, particularly heavier sleepers and side sleepers. 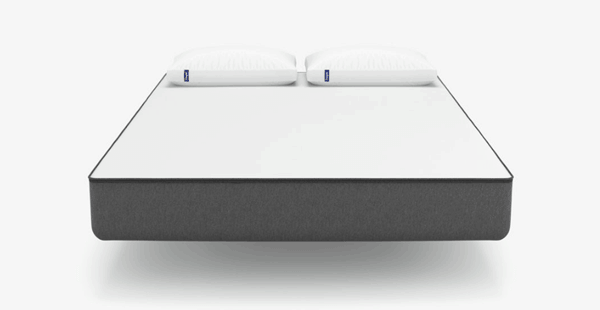 Back sleepers, middle of the bed sleepers, and people weighing less than ~250lbs will still get a decent night’s sleep out of this mattress, but there are some things we’d like to see improved for Casper’s next iteration. We’d like to be very clear, the Casper is still a good mattress, and the combination of the different foam layers, as well as the addition of the poly foam layer on top of the memory foam, mean that the mattress will still provide a solid night’s sleep for most people. It’s just that there are so many mattresses with these materials and at this price point that the Casper faces some stiff competition. The other problem that we had with the Casper was the lack of edge support. While it’s reasonable to expect less edge support from a foam mattress than you would get from other kinds of mattresses, the Casper is on the bottom of those rankings. Lack of edge support means that the mattress isn’t as good for side sleepers, edge sleepers, and may not be as good for adult bedtime fun. If you like the good aspects of the Casper mattress, but want to do a bit better, try looking into the Leesa, Loom & Leaf, Helix, and Brooklyn Bedding options. There’s plenty we like about each of those mattresses that we also like about the Casper, but they don’t suffer from as many drawbacks or issues. They are, for the most part, price competitive or cheaper than the Casper, so at the very least check out our reviews of them and see if they might be a better fit for you.